Sunday December 9th 1900 It turned quite cold last night. We did not get up very early and I was busy about the work all forenoon Mort did not go to town. I read and wrote what spare time I had. It was two years today since Edith died Dear Little thing how long it seems since we saw her. 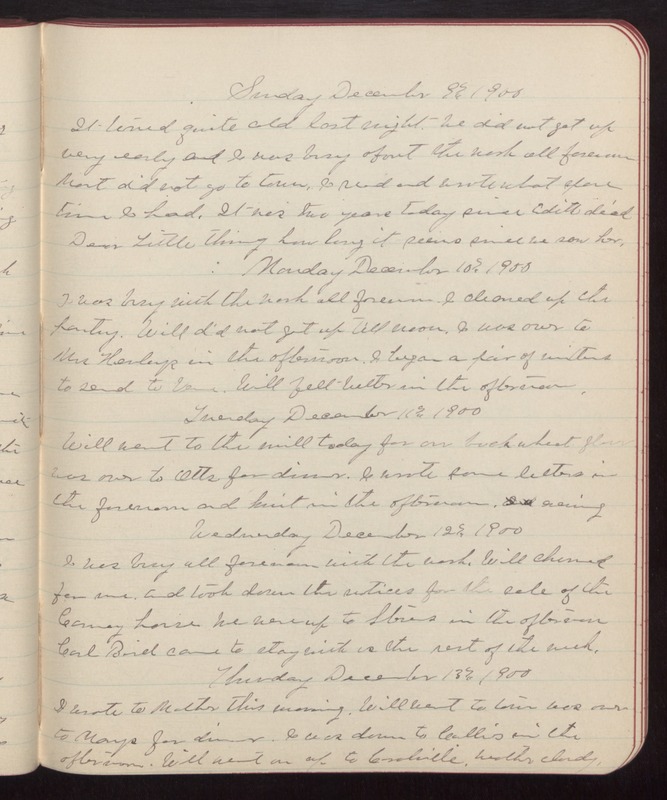 Monday December 10th 1900 I was busy with the work all forenoon. I cleaned up the pantry. Will did not get up till noon. I was over to Mrs Henleys in the afternoon. I began a pair of mittens to send to Verne. Will felt better in the afternoon. Tuesday December 11th 1900 Will went to the mill today for our buck-wheat flour was over to Otts for dinner. I wrote some letters in the forenoon and knit in the afternoon. and evening Wednesday December 12th 1900 I was busy all forenoon with the wash. Will churned for me. and took down the notices for the sale of the Carney house. We were up to Stevens in the afternoon Carl Bird came to stay with us the rest of the week. Thursday December 13th 1900 I wrote to Mother this morning. Will went to town was over to Mays for dinner. I was down to Callies in the afternoon. Will went on up to Coralville. Weather cloudy.